I was working at the church on Tuesday morning when this big ol' box of fun arrived for me. 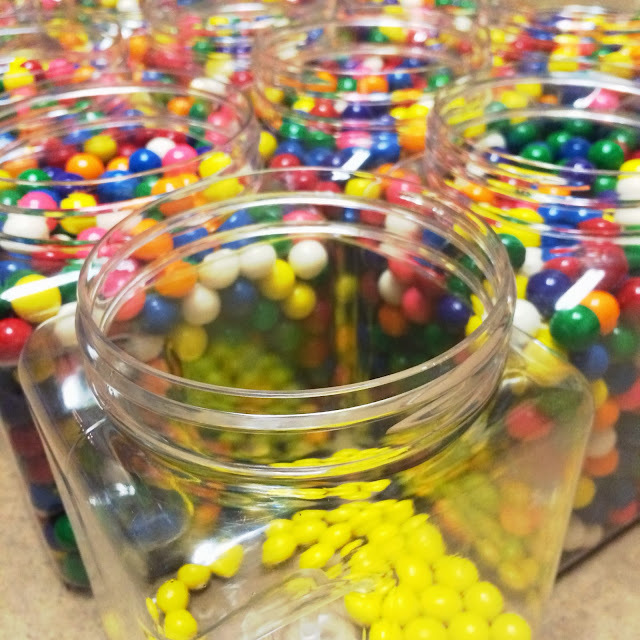 Oh yeah, there are over 8,000 gumballs in there. Truly. Also true, other staff members couldn't help shaking the box and wondering what could possibly be in a box labled "Box of Fun". Ideas abounded, none as random as the truth. 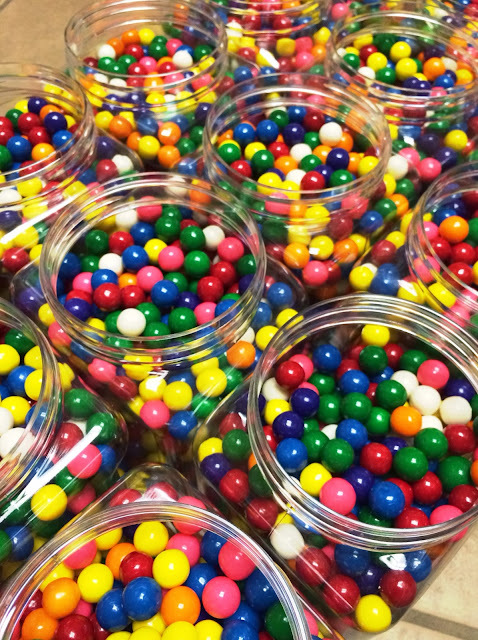 Gumballs. 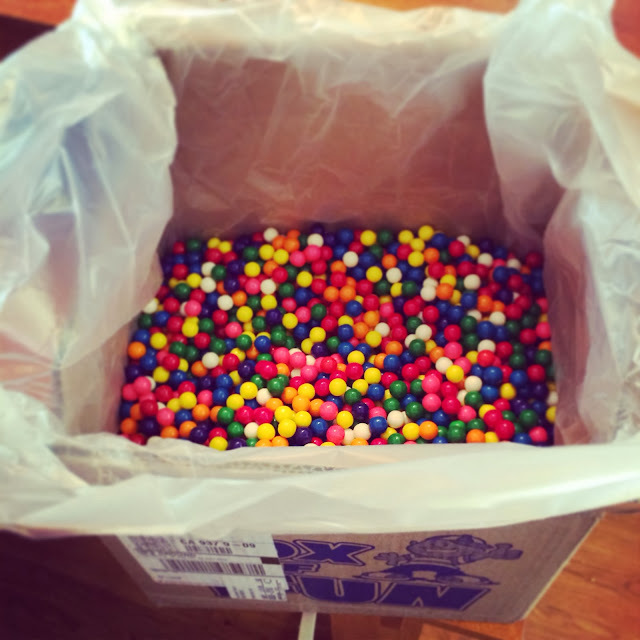 Why in the world did I order a box of over 8,000 gum balls? I'll give you two hints: Nobody is eating them (so my jaw is going to continue to work properly after this week and my teeth will continue to stay whole), and the number we were going for was 8,760. In case you didn't know, that's the nunber of hours in a year. I filled jars from Dollar Tree with them. I am using them in an orientation for parents to help them understand why our Kids Co (the name of our program) does not want to take the sole responsibility for their children's spirituality and why we are not doing traditional "Sunday School". Rather, we are developing interactive small groups on Sunday morning which are reinforcing lessons that we expect parents are already teaching at home. We are helping parents learn to take initiative and leadership in teaching their children about God and His Word. Our leaders are making church a safe place to ask questions, interact with their leader and grow personally through interaction with God's Word. On the things that matter most in the life of their children, parents should be on the front lines. It was 14 jars full you guys. 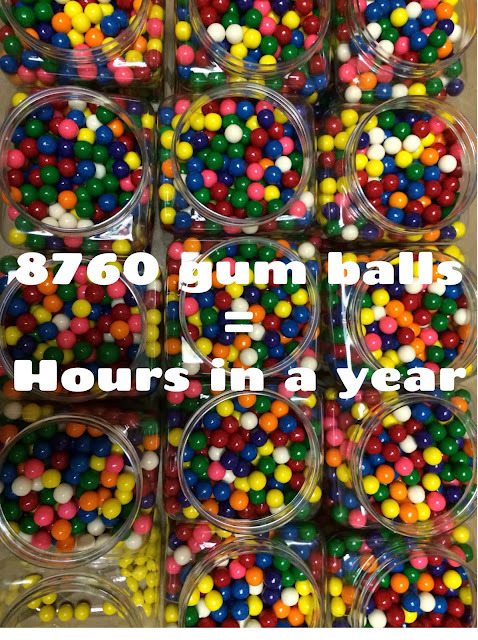 That's a lot of gumballs. I had to drop some math skills on this whole project. And time. Lots of time. 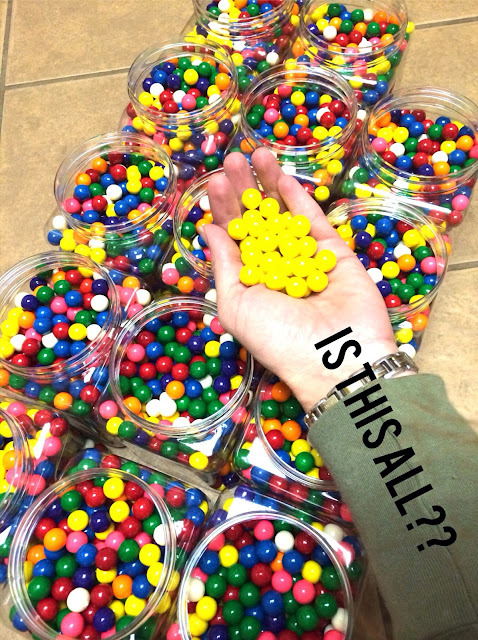 1 gum ball, 2 gum balls, 3, 4.....luckily the box said that one bag was 8,500. I took their word for it. 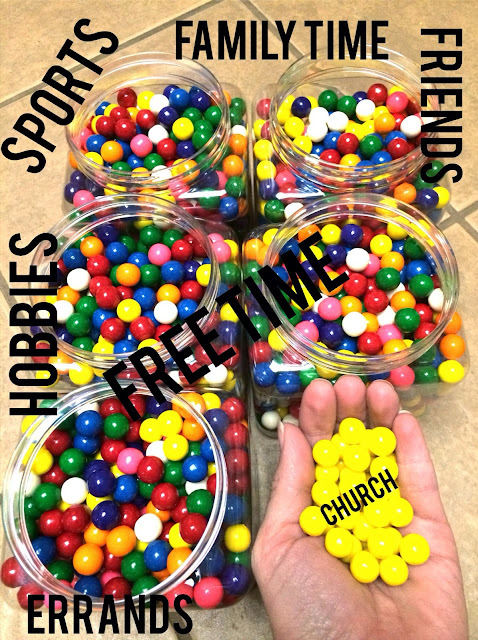 Do you know how much of that time in a year is spent at church? 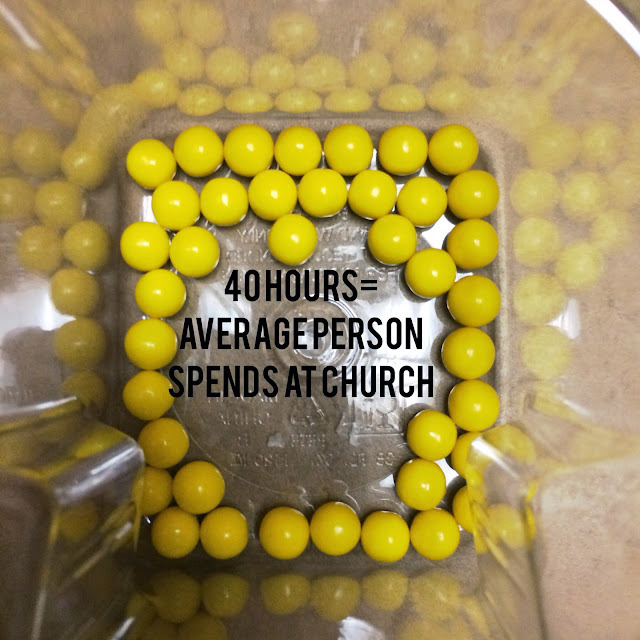 The average family goes to church about 40 times in a year. Because, common on - we know, most people do not hit 100% attendence. 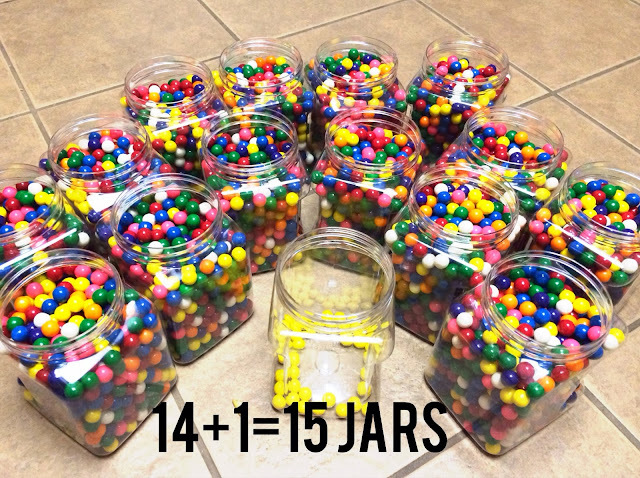 So I took out 40 yellow ones for it's own jar. 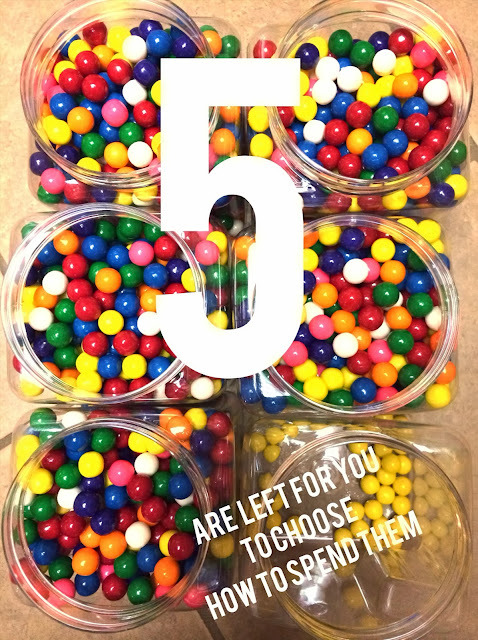 But of course, it's not like all those gumballs in those 14 full jars are spent doing whatever you want with your kids. I am making an assumption that kids get an average of 10 hours of sleep a night. Maybe. (Insert sleep-deprived Mom jokes here). Give or take their age. 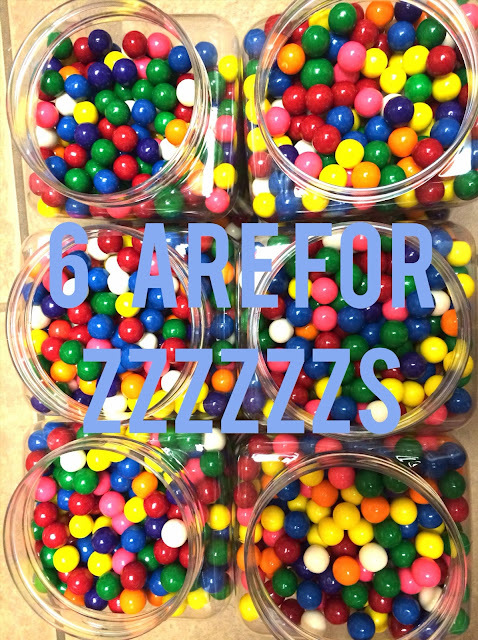 We are averaging, so that takes out about 6 jars for sleeping. And they go to school and have homework. 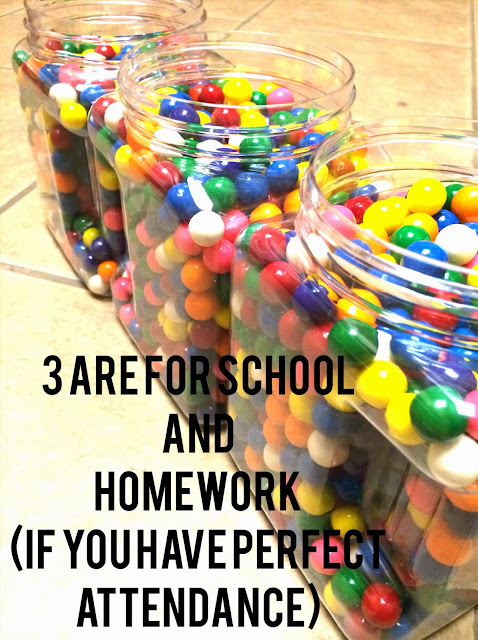 At 180 days that would be 2.3 jars, but 3 if you count average homework loads. I assume your kids are going for the typical 8am-3pm school day. So that leaves 5 for everything else. What else do you fit in here? Sports, extracurricular, family time, friends, errands, naps, driving, chores, hobbies, free time, eating, cleaning....and church. Just for comparison.....all the yellow can fit in my hand (and I have small hands). Here it is against the 14 jars full. I think you see my point. 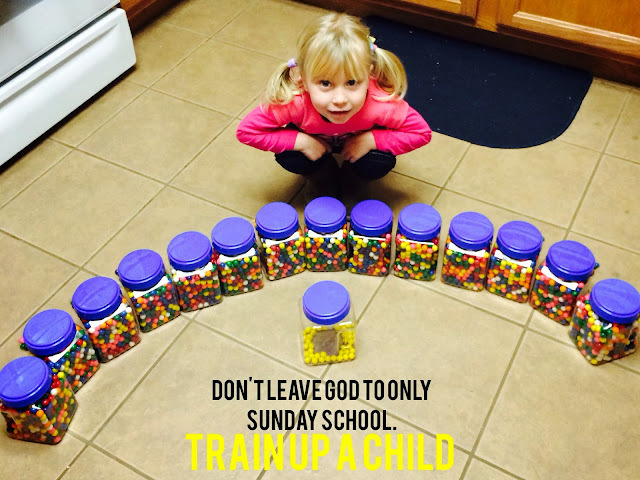 If we leave all the spiritual teaching to the church, how much do you think it will affect your child's life? How does it stack up against all the other priorities of life? This is why when you are going about doing all the things that fill those other 5 jars you need to be diligent about speaking to them about how God is integrated into every area of life. God and spiritual matters affect everything. It should never be compartmentalized into an hour on Sunday, segregated from everything else we do in life, nor should it be when teaching our children. It can seem intimidating, but start with simple lessons, Bible stories, and feel challenged to dig deeper and read the Book yourself. Because my guess is that you need more that 40 hours in a year as well. I love this post. Makes you realize how intentional we have to be with our kiddos. No one else is going to do it for us.